This workshop shall be run via whatsapp mode. 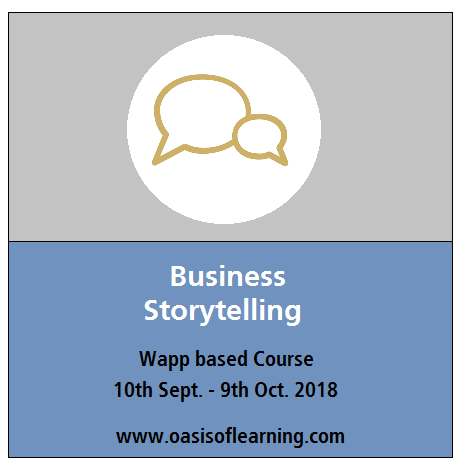 The course will have practical nuggets (voice files messages, videos, formats, exercises and booklets) to help you understand the basic building blocks of business Storytelling along with the tools, techniques and tactics for exploring, sorting, preparing and presenting business stories for various professional situations. In case you want to get a feel of the whatsapp session, feel free to look at some of the screenshots from the previous batch by clicking here. The charges for the workshop are INR 1999/-. You may pay via cheque, EFT or PayTM (9999598964). The next batch for Business Storytelling via Whatsapp will start in Nov. 2018 first week. If you are interested in this workshop, please fill up this form.